Y’all, how cool is that!! I was a senior in High School when I submitted this poem I wrote in my English class. My teacher probably brought it up for us to submit anything we wanted, if we were interested. I just searched the company’s email address and it turns out they were trying to contact me since 2012, but I was locked out of that email until earlier this year. (oops) Needless to say I think it’s pretty cool and it inspired me to continue writing. I’ve always loved art, photography, and writing, and not to brag but I’ve always been good at all of them. In High School I got accepted into the AP art program without taking any previous art before this class. I grew and learned so much from this class too!! I recently started pursing my photography business and I love it so much. I love being able to help people while doing things that I truly enjoy doing. And I’d like to say that I honestly think that it’s so important to make sure you’re doing something you love doing, because if you’re just doing it to impress people or because that’s the way society says you need to live your life…you need to just stop it, right now. Give yourself a reality check and make sure you’re truly enjoying your life and fulfilling your calling and all your dreams…every single one of them! There’s no one standing in your way except YOU! So make sure you realize that and do whatever you need to do to fulfill your dreams, because you only live once. Also, I’d like to throw out there that if you’ve never read the book called “You are a Badass” by Jen Sincero, then you should! I listened to it on audible within a couple days! It is such a great book and seriously changed the way I thought and looked at life. -Side note-if you want to listen to it then let me know and I can send it to you on audible for free. 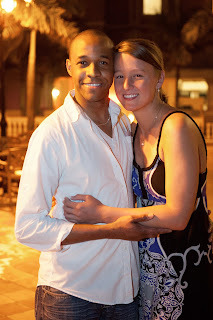 We got engaged the winter of 2013 on the beautiful island of Jamaica at the RIU Resort in Ohio Rios, Saint. Ann on the third night of their seven day stay on the island. After we arrived, on day one, Phillip told me he was going to book dinner at all the restaurants for the week and left her on the beach sun tanning for over an HOUR!!! Little did I know that he was actually planning an eventful time! Of a lifetime, Yes! I waited and waited on the beach but there was no sign of his return…so I ended up walking around trying to find him. There was no sign of him anywhere, so I just got a pina colada and went back to the beach. During the time he was gone, he met and was in coordination with the Resort’s officials to finalize the key location and the actors who would take part in the event. By later that evening she was upset at him upon his return, “Our first day here and you left me all by myself, where were you so long?” she asked. He apologized “The lines were long and I had to wait.” When the second day arrived, I was served breakfast in bed. Gifts of the prestigious Blue Mountain Coffee were delivered, and the day had started out better than the previous day. Phillip did over and beyond everything she requested of him-to his soon to be fiancee. This included all the excursions that were offered for that day and laying out on the beach in the sun, certainly not a “chocolate skin thing” right? Every second was well deserved as it felt like the second day was their first day vacationing. I was happy and she mentioned nothing about the first day, did I forget already? On the third day, the temperament was right, and everything went as planned. I woke up to an organized anonymous knock that followed with a silence from the main entrance of the suite. Upon arriving to see who was there, instead I found an envelope safely slipped from under the opposite side of the door, the deliverer, gone. Enclosed was a treat for a full body massage at the spa that would last quite a while. This was perfect for Phillip, he needed to close open arrangements while avoiding a redo of their first day. They met for breakfast then went their separate ways, and then met again for lunch and enjoyed the rest of the day together. I was happy and relaxed by full body massage at the spa. At this point Phillip was noticeably nervous but he remained calm. He instilled the idea that perhaps, they should inquire what the cost would be to professionally capture some pictures on the beach. That night, they were going to know if they were really meant for each other and I had no clue what was in store. We got dressed and headed to dinner. On the way, Phillip had discretely organized a camera man to be at a specific spot on the way to their “normal nightly booked dinner” to take their pictures. Though this camera man would also have another role to play, the role of an annoying photographer and sure he did do that well. I was caught off guard but didn’t think much of it due to our conversation we had earlier, so it worked out perfect as I just thought that now we had the perfect opportunity to snap some quick photos. The camera man, lured the us in, taking multiple pictures in different poses. He offered that the we follow him to the beach as he knew a nice location with good lighting and a perfect background-which by the way, I thought was a little odd because it was practically dark outside. As we were getting “late” for their “dinner” I was kind of irritated by him. He had a deep Australian-Jamaican accent and kept on saying “yes, like this, yes like that, nice” and so on after each picture he took. The camera man was very good at being annoying. The couple followed and more pictures were taken but this location happened to be secluded, though foreseeable from a far that Phillip had it setup for me. 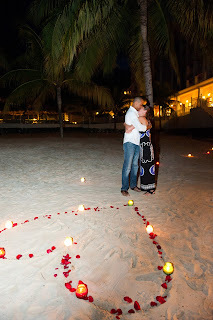 As we approached the area, the pathway were lit with candles the entire walkway towards the dinner table, dressed with flowers, with a personal letter from Phillip addressed to Lauren seated on a white table cloth on the beach front. Me being an introvert, I wanted none of this and was hesitant to trespass the area. I said to Phillip, “why would we photo bomb another person’s setup to take our pictures”, but little did I know, the setup was all for me. 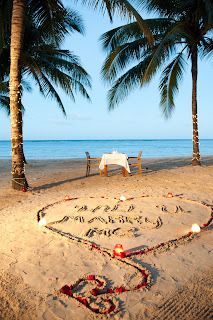 We arrived at the table together, and I noticed a heart, dressed with red and white rose-pedals which wrote “WILL YOU MARRY ME?” before the table. At this time people had started to gather from a far, speculating on the outcome for a special moment they assumed. I still did not get it, that this was for me and I even said “wow” to express in admiration of how beautiful the setting was. As we came closer to the decorated heart, Phillip then held my hand and asked the big question softly, “Lauren, will you marry me?” x3 the moment became still, every blink of an eye seemed like an hour, the camera man still taking shots was no longer annoying and I was no longer worried about missing dinner, because, I was at dinner. I answered Yes! x3 in awe. I was then greeted with single a white rose, which is my favorite flower. I could not believe this was really happening. The crowd roared from a far as they understood what the scenery meant. We hugged and we kissed and away went the camera man. We were exquisitely treated and catered for by the exclusive Sirr Richards Restaurant, the most elite of all on the resort. The orchestrated private dinner on the beach was accompanied by a personal waiter and included a 5 course meal. We feasted for several hours as we intermittently took walks between courses, because hey we had the beach all to ourselves!! We then enjoyed the remaining two days at the RUI Resort living as royals but by then the word had spread fast and everywhere we went, people knew who we were. We then left from Ocho Rios and headed to Negril, west of the island where we spent our last couple of days at Sandy Haven Resort before returning to the United States, and met with some of Phillip’s family to enjoy the rest of their stay. Late December when we returned from the Jamaica, we immediately started a Facebook guest list private group with the intention for a Big Wedding but later changed our minds, stating “We just couldn’t wait, we wanted something more personal, private and most importantly sacred”. We did well and steered away from the publicity by choice. On March 24th 2014, we had a private ceremony where we became one in marriage covenant. Today we are living happily as can be and enjoying Ashleigh Elizabeth, our first baby girl. 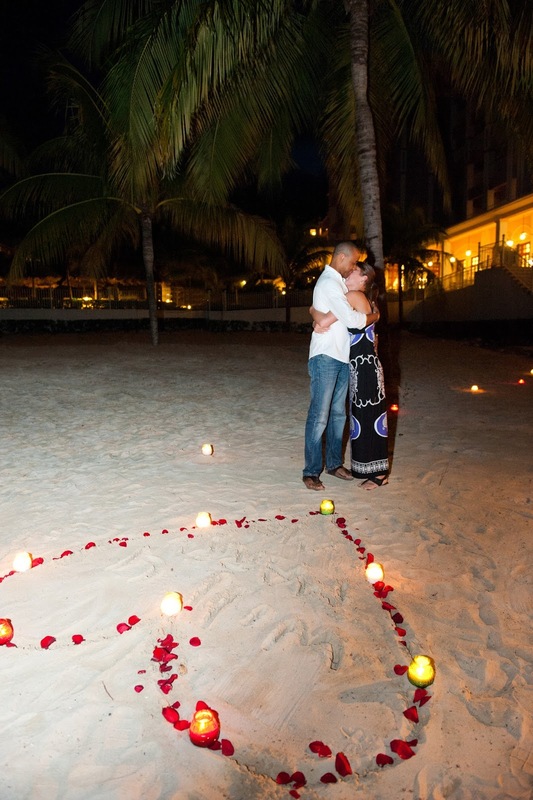 We are planning to return and renew our vows on an anniversary on the island. We think it would be romantic and that this time we would like to share our vows in front of friends and family, if they are willing. P.s If you’ve never been to Jamaica, GO!!! Everyone always enjoys hearing birth stories, so I figured I’d start with telling you Ashleigh’s birth story. I was blessed to have a very easy pregnancy. I didn’t have morning sickness, I didn’t swell up like a balloon and I really enjoyed being pregnant. I am very thankful for this, because I know some people can have a rough pregnancy. Ashleigh was due on September 1, 2014 but she came on September 5, 2014. The day before I went into labor, I was trying all the tricks to help jump start labor…from raspberry tea, primrose oil, walking around and everything you’re supposed to eat. I got home from a busy day of trying to jump start labor and bounced on the exercise ball for a while and then I decided I was going to take a break and try to get comfortable enough to sleep…because I knew I was going to need it! So, I ended up falling asleep and in between waking up a million times to pee, I was woken up at 12:30 AM by some painful contractions, (or what I thought to be-it was hard to say because I’ve obviously never felt them before this point). They weren’t very consistent so I just tried to fall back asleep which was super difficult at this point. So I ended up getting up and taking a shower hoping that would help ease the pain and it actually didn’t so, it was around 2:45 AM when I couldn’t take the pain anymore and woke up Phillip and told him I thought I was in labor! He jumped up and showered and got dressed while I emptied the dishwasher and cleaned up the house-because I didn’t want to come home to a dirty home! Ha. Ha. I let my mom know and she got ready to meet up for some breakfast. We loaded up the car with my hospital bag at least a month in advance so we would be prepared for this moment! So, we were on our way to meet my mom at McDonald’s-this was the only place open at this time of morning!! The road we took had what seemed like a million speed bumps that made my contractions hurt so much worse! I kept telling Phillip to slow down until we were practically barely moving. We lived less than 10 minutes from the hospital and about 5 minutes from McDonald’s and somehow Phillip managed to take a wrong turn on the way. Looking back at it now, it’s hilarious but at the time I didn’t think it was so funny. We finally made it to McDonald’s, I ordered two cheese biscuits and hash browns with a water and Phillip got two sausage biscuits and hash browns with orange juice. We ate this in the car since they weren’t open yet and my mom talked to us from the window and enjoyed her coffee. After we finished eating we headed to the hospital! We got there around 4:45 AM and we had already signed all the papers so we wouldn’t have to wait long to get our room. They checked us in, and we headed back to check my contractions and they determined that I was indeed in labor and 2 CM dilated. Here’s a picture of us heading back into Labor & Delivery. After verifying that I was in labor we headed into our room and we made ourselves comfortable. At first my mind was made up that I would know when I started having contractions if I was going to need an epidural or not….and once they started getting worse I just knew, but I tried as long as I could and after curling up in the fetal position grabbing onto the side of the bed for dear life, I made up my mind that I needed it! At this time it was around 10:30, so I made it a while without it, but seriously couldn’t take the pain any longer. I anxiously waited on them to bring in the anesthesiologist and when I saw him walk through the door I felt some relief. After he gave me the epidural I was able to relax a little and I tried to sleep, but there were so many emotions running through my mind that I couldn’t. Phillip and my family were very supportive the whole time even though I probably wasn’t the nicest person. I remember that everyone kept brushing my feet as the walked by the foot of the bed and I kept getting so mad because I could sense that they were hitting my feet but I couldn’t feel it and it was just so frustrating to me!! As time passed I wasn’t progressing in dilation so they ended up giving me pitocin to help speed up the process. I didn’t really want this but at this point it was around 3:00 PM and I was ready to meet our little princess!! At this point I was getting kind of frustrated because I was born at 4:34 PM and wanted Ashleigh to be born at the same time! But, the time passed and finally at around 5:00 PM I was at 10 CM and I started pushing….and pushing..and pushing…oh and don’t worry I’m STILL PUSHING…for 2 hours and 45 minutes…every 1-2 minutes I would have a contraction so I really didn’t get a break!!! I was so exhausted and anxious, I just remember closing my eyes and trying my best and trying not to give up. She really didn’t want to come out, but finally she made her grand entrance at 7:47 PM. It wasn’t as magical and blissful as I had imagined as they thought that she pooped while she was still in the womb, and this can cause problems if they swallow it, so they had to take her away immediately and check her out to make sure she was okay. I was very frightened because I didn’t know what was going on. Finally after less than 10 minutes, which seemed like an eternity, the nurse brought her over to me and explained what happened. She assured me that she was just fine and we could spend a little time with her before they had to take her away AGAIN to bathe her and do whatever else they do. This is the one thing that irritates me about hospitals, they don’t care about your birth plan at all. They finally brought her back to our room and we were so happy to have her back with us!